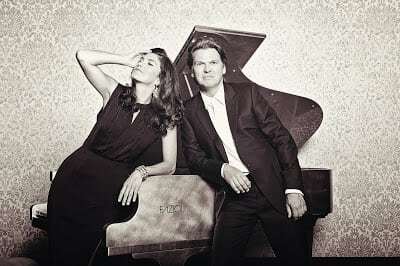 VANCOUVER, BC – Vancouver’s very own Bergmann Piano Duo, Elizabeth and Marcel Bergmann, are on tour around British Columbia and Alberta during October and November with a FAZIOLI and a Grotrian, two beautiful European grand pianos from Showcase Pianos. The dynamic couple’s energetic and electrifying performances have inspired audiences with a diverse programme for the past two decades. They have toured extensively around the United States, Italy, Germany, Holland, Greece and Canada. The Bergmann’s have also been a part of various international festivals such as the San Francisco International Music Festival, MusicFest Vancouver, the Gilmore International Keyboard Festival, the Banff Arts Festival, the Royal Bank Calgary International Organ Festival and Competition, the International Two Piano Symposium and Schubertiade, Miami, the Tage für neue Music, Darmsadt, the Braunschweiger Kammermusik Podium and at the Expo 2000, Hannover. The duo has also recorded for the CBC, the National Public Radio, and several stations in Germany. FAZIOLI pianos are now widely regarded as the finest in the world, and are still considered to be quite rare. Having one go on tour throughout the smaller city centres in British Columbia gives many a chance to experience one in real life that wouldn’t have otherwise had a chance to hear one.